RETRO KIMMER'S BLOG: LEGENDARY SCREEN CARTOONIST RON CAMPBELL AT SOUTH X SOUTHWEST!! LEGENDARY SCREEN CARTOONIST RON CAMPBELL AT SOUTH X SOUTHWEST!! 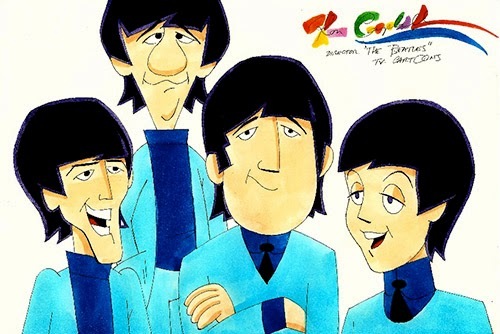 Ron was the director of the 1960s Saturday Morning Beatles Cartoon TV series and animator of the Beatles film Yellow Submarine, will mark the historic anniversary by appearing live during SXSW at Wild About Music, 115 E. 6th Street from Saturday, March 8th through Saturday, March 15th. 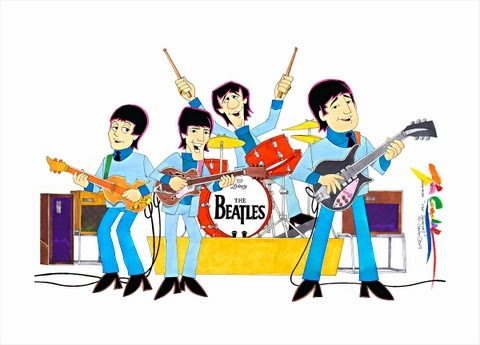 Ron will showcase his original Beatles cartoon paintings created specially for the show and create new Beatles pop art paintings live at the exhibit. AUSTIN, TX - It was 50 years ago that the Beatles invaded the United States, performing for 73 million people on the Ed Sullivan Show and began dominating the US pop charts for years. Now five decades later, the Fab Four continue to be the most celebrated musical group in Rock history. 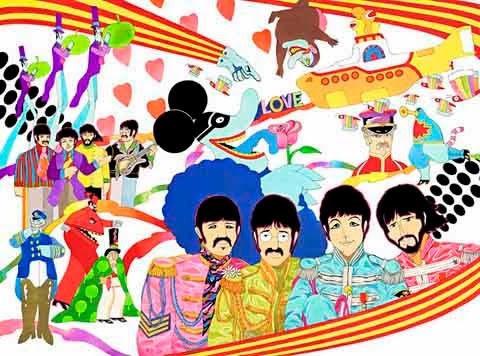 Beatles celebrations are continuing throughout the country including many television, radio and live concert tributes. Ron Campbell, director of the legendary Saturday morning Beatles Cartoon series that aired on ABC from September 25, 1965 through April 20, 1969 and animator on the Beatles film Yellow Submarine will make a rare personal during SXSW at Wild About Music, commemorating the 50th anniversary of the Beatles historic invasion of America. 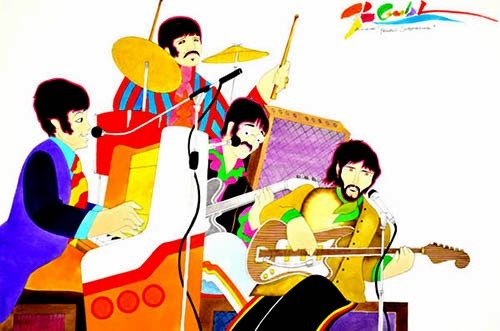 Yellow Submarine, recently celebrating its 45th anniversary, has become a permanent fixture in pop culture, defining the psychedelic 60s for generations to come. In his book, Up Periscope, Yellow Submarine Producer Al Brodax gives Ron Campbell a great deal of credit for saving the movie Yellow Submarine and tying it all together at the last minute. 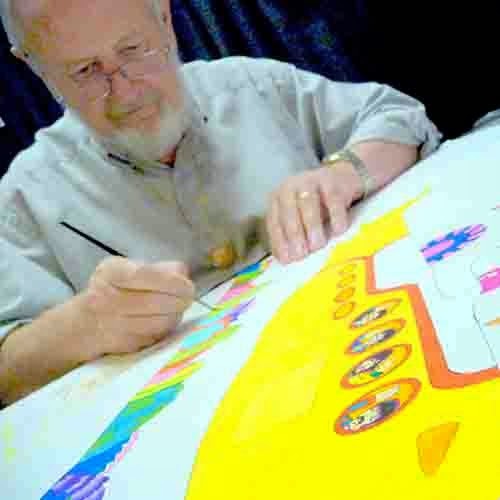 Ron Campbell has also been involved with some of the most beloved cartoons including, Scooby Doo, Winnie The Pooh, Krazy Kat, George of the Jungle, The Jetsons, The Flintstones, the Smurfs, Goof Troop, Rugrats, Winnie the Pooh, Ed, Edd & Eddy and dozens more. Campbell ’s former studio was awarded a Peabody and an Emmy for his work in children’s television. Since retiring after a 50 year career, he has been painting subjects always based on the animated cartoons he has helped bring to the screen.